If you’re just joining the story here is a link to the beginning. Mitch and I had survived some impromptu white water canoeing. We had dragged the canoe to the beach and were collecting gear and enjoying victory beer when Creepy Rob’s car rattled up beside us. “Guess what we scored off some locals! ?” Skip asked, triumphantly waving a plastic sandwich bag full of ‘shrooms. Crap, I thought. Those things always made me sick at some point, and were guaranteed to cause random weirdness. On the other hand, how much worse would it be to be sober around these dudes on ‘shrooms? “Of course they did,” I said. Hippies can be the source of many things; aside from shenanigans related to mind altering drugs, I can think of jam band music, lice, hacky sack, and Kombucha, just off the top of my head. So we made bacon lunch and some special tea. That’s when the mosquitos attacked. The bacon must have drawn them in, but within ten minutes we were covered in welts and slap marks from beating ourselves senseless trying to kill the frickin’ things. Mitch and I decided to move our camp a bit farther away from the beach just to give the little bastards a longer commute. Then we waited. Led Zepplin played out of the open window of Rob’s car. “Nothings happening,” griped Mitch, helpfully pointing out the obvious. “We should just drink more, maybe it’s kind of weak…damn hippies.” said Rob. “Where have I heard that before?” I snarked. I was the only one who didn’t drink more tea. I had a beer instead. An hour after dark, our camp turned into some kind of giggling science experiment. Well I’m not sure about the science part, but there was definitely an experiment being conducted. Perhaps you recall that, on a whim, we’d thrown a spear gun in with the sleeping bags? Mitch and Skip paced off how long the shock-cord on the spear-gun was, with the idea that it would “look really cool flying at you.” That’s when I decided that we should probably all go for a long walk. And hide the spear gun for the rest of the evening. Our group was beginning to attract a little attention. The walk was important because I really didn’t want to explain things to a ranger. Mostly in case he wasn’t real and I was talking to a tree, and then a real ranger came along and…let’s just say things were getting weird quick and, since I had consumed, far less of the tea than everyone else, guess who got to be the baby sitter? We grabbed some bottles of water and flashlights, and headed out on a deserted logging road to look at stars. It was a beautiful night, and the walk was hilarious. I kept having to explain to Creepy Rob that, while he had indeed walked through a real spider web at one point, he definitely was not currently covered in spiders, and there were not spider webs everywhere that we keep running into. It was exhausting. Rob kept exploding into the flailing dance of an unexpected spiderweb encounter. And of course I had to keep reminding Skip and Mitch that walking off the road into the woods might get us lost. Like for real lost. Not like lost in some theory that the entire universe was actually inside a giant snow globe that sat on a desk in our old high school principal’s office. I made a mental note to maybe broaden my selection of camping buddies. That’s about when we ran into some locals. A couple of guys in a beat up Dodge Power Wagon skidded to a stop in front of us on the road. They were probably on the way home from a hard day of poaching and thought it curious that four city guys were wandering around in this neck of the woods wearing Doc Martens and Slayer shirts. I managed to corral my dream team to the side of the road to let them pass. I was hoping a wave or nod would suffice. “Howdy,” one of them called out the window as the truck crept up to us. “Whatcha’ doing out here? You fellas lost?” He flicked a cigarette into the night. Our group collectively watched the tracer round spin through the air, like cats following a laser pointer. I looked back at him and he smirked. We made an interesting sight I’m sure. Rob and Skip were muttering stuff to each other. Mitch was just standing next to me staring at the guys in the truck. It was a little uncomfortable. I should say something, I thought. Right then, Skip walked over. 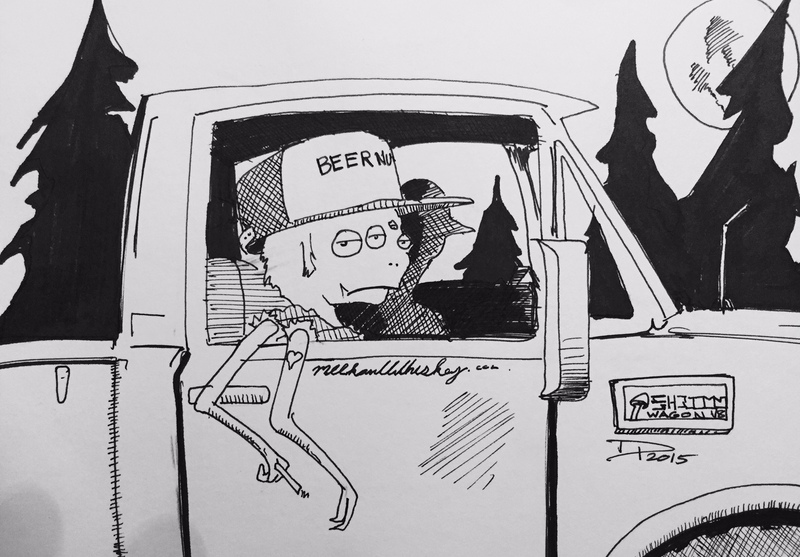 “Hey Whiskey, Rob’s covered in spider webs again” He looked at the truck. “Do you guys have some huge spiders out here?” He asked innocently. Rob was clawing at his hair in the headlights, his eyes huge and panicky. “That’s nice, makes a good soup I bet. I’m a bit of a fungophile myself, sure do love me some morels” I really wanted to stop dealing with this guy and go back to Looney Tunes live. “Well, you fellas take it easy?” I offered. The guy driving belly laughed and they peeled out, spraying gravel all over us. “Well, those guys were nice” Mitch said. “What if they come back?” asked Skip. “Spiders!” Yelled Rob and dove into some bushes. We hid in the bushes until Rob felt safe, then went to a meadow and looked at the moon, it was amazing. Finally the mushrooms started to wear off, so we walked back to camp with our eyes peeled for spiders or a battered pickup truck. When we finally got back to camp we saw something that stopped us in our tracks. A huge tree had fallen in our camp site. It lay exactly where Mitch and I had previously pitched our tent, and would have crushed us like bugs. We spent about two hours around the campfire discussing fate and mortality. The ranger stopped by in the morning and told us how lucky we were. Yeah… lucky. I dunno. If it were Northern Minnesota, I’d suspect the mosquitoes had something to do with the tree toppling over. I have spent many a terrible evening fearing the worst as mosquitoes plotted in sinister tones outside my tent.